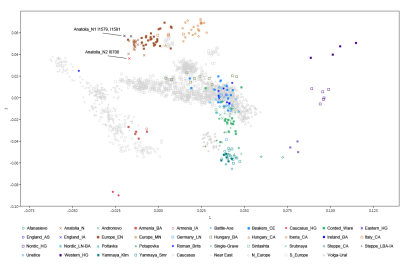 A new paper at PLoS ONE reveals that three individuals from Early Medieval burials in southern France belong to Y-chromosome haplogroup E1b1b1b-M81 and mtDNA haplogroups H1, K1a4a and L1c3a, and thus were probably of North African origin. Abstract: The rapid Arab-Islamic conquest during the early Middle Ages led to major political and cultural changes in the Mediterranean world. Although the early medieval Muslim presence in the Iberian Peninsula is now well documented, based in the evaluation of archeological and historical sources, the Muslim expansion in the area north of the Pyrenees has only been documented so far through textual sources or rare archaeological data. Our study provides the first archaeo-anthropological testimony of the Muslim establishment in South of France through the multidisciplinary analysis of three graves excavated at Nimes. First, we argue in favor of burials that followed Islamic rites and then note the presence of a community practicing Muslim traditions in Nimes. Second, the radiometric dates obtained from all three human skeletons (between the 7th and the 9th centuries AD) echo historical sources documenting an early Muslim presence in southern Gaul (i.e., the first half of 8th century AD). Finally, palaeogenomic analyses conducted on the human remains provide arguments in favor of a North African ancestry of the three individuals, at least considering the paternal lineages. Given all of these data, we propose that the skeletons from the Nimes burials belonged to Berbers integrated into the Umayyad army during the Arab expansion in North Africa. Our discovery not only discusses the first anthropological and genetic data concerning the Muslim occupation of the Visigothic territory of Septimania but also highlights the complexity of the relationship between the two communities during this period. A novel computational method for detecting identical-by-descent (IBD) chromosomal segments between sequenced genomes is presented. It utilizes the distribution patterns of very rare genetic variants (vrGVs), which have minor allele frequencies less than 0.2%. Contrary to the existing probabilistic approaches our method is rather deterministic, because it considers a group of very rare events which cannot happen together only by chance. This method has been applied for exhaustive computational search of shared IBD segments among 1092 sequenced individuals from 14 populations. It demonstrated that clusters of vrGVs are unique and powerful markers of genetic relatedness, that uncover IBD chromosomal segments between and within populations, irrespective of whether divergence was recent or occurred hundreds-to-thousands of years ago. We found that several IBD segments are shared by practically any possible pair of individuals belonging to the same population. Moreover, shared short IBD segments (median size 183 Kb) were found in 10% of inter-continental human pairs, each comprising of a person from Sub-Saharan Africa and a person from Southern Europe. The shortest shared IBD segments (median size 54 Kb) were found in 0.42% of inter-continental pairs composed of individuals from Chinese/Japanese populations and Africans from Kenya and Nigeria. Knowledge of inheritance of IBD segments is important in clinical case-control and cohort studies, since unknown distant familial relationships could compromise interpretation of collected data. Clusters of vrGVs should be useful markers for familial relationship and common multifactorial disorders. More than two decades of archaeological research at the site of Sagalassos, in southwest Turkey, resulted in the study of the former urban settlement in all its features. Originally settled in late Classical/early Hellenistic times, possibly from the later fifth century BCE onwards, the city of Sagalassos and its surrounding territory saw empires come and go. The Plague of Justinian in the sixth century CE, which is considered to have caused the death of up to a third of the population in Anatolia, and an earthquake in the seventh century CE, which is attested to have devastated many monuments in the city, may have severely affected the contemporary Sagalassos community. Human occupation continued, however, and Byzantine Sagalassos was eventually abandoned around 1200 CE. In order to investigate whether these historical events resulted in demographic changes across time, we compared the mitochondrial DNA variation of two population samples from Sagalassos (Roman and Middle Byzantine) and a modern sample from the nearby town of Ağlasun. Our analyses revealed no genetic discontinuity across two millennia in the region and Bayesian coalescence-based simulations indicated that a major population decline in the area coincided with the final abandonment of Sagalassos, rather than with the Plague of Justinian or the mentioned earthquake. In agreement with published data from modern Turkish populations , lineages of East Eurasian descent assigned to macro-haplogroup M were found in the modern sample from Ağlasun. This haplogroup is significantly more frequent in Ağlasun (15%) than in Byzantine Sagalassos, where it is absent (the non-significant value of the Roman sample might be most likely due to its low sample size), thus indicating that this East Eurasian component may have been introduced later, either recently or even as early as the Seljuk invasion of Turkey in the eleventh century CE. Cosmetics have been studied for a long time in the society and culture research, and its consumption is regarded as a cultural symbol of human society. This paper focuses on the analysis of the red cosmetic sticks, found in Xiaohe Cemetery (1980–1450BC), Xinjiang, China. The structure of the red cosmetic sticks was disclosed by SR-μCT scanning (Synchrotron Radiation Micro-computed Tomography), while the chemical components were characterized by FTIR (Fourier Transform Infrared Spectroscopy), Raman Spectroscopy and Proteomics. The results suggested that the cosmetic sticks were made from the cattle heart and covered with a layer of hematite powders as the pigment. Given the numerous red painted relics in Xiaohe Cemetery, this kind of cosmetic sticks might be used as a primitive form of crayon for makeup and painting. The usage of cattle hearts as cosmetic sticks is firstly reported up to our knowledge, which not only reveals the varied utilizations of cattle in Xiaohe Cemetery but also shows the distinctive religious function. Furthermore, these red cosmetic sticks were usually buried with women, implying that the woman may be the painter and play a special role in religious activities. Update 05/08/2016: the paper, titled Demographic Development of the First Farmers in Anatolia, is out and open access at Current Biology. See here. Sedentism, farming, and herding in West Eurasia first started in the Fertile Crescent around 11,500 BP. From there, Neolithic culture spread into Central Anatolia and the East Mediterranean, and eventually, reached Southwestern Europe. The demographic dynamics behind these processes has long been of interest. Recent archaeogenomics studies showed that the arrival of farming in West Europe happened through migrating Neolithic populations. But where had these migrations themselves initiated? 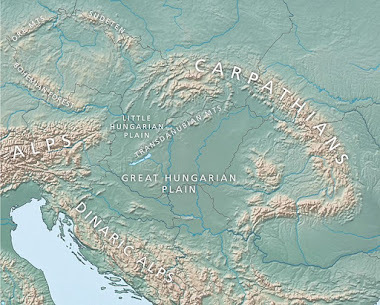 Based on material culture studies, it has been suggested that Neolithic culture first spread from Central Anatolia to the Aegean Sea and the Balkans, by cultural diffusion. But this hypothesis has not yet been tested by genetic data. Here we address this question by screening the genomes of 15 Central Anatolian individuals from different Neolithic sites (10,000-8,000 BP). Four of these were sequenced to >0.1X coverage, and the data was combined with published Neolithic genomes. Our results indicate that Central Anatolian Neolithic individuals genetically resembled the first migrant Neolithic populations found in Europe, rather than modern-day Anatolians. At the same time, Central Anatolian Neolithic individuals appear to cluster together, to the exclusion of other Neolithic populations. Using simulations, we evaluate demographic models that could explain these patterns. Our results suggest that the migration processes that eventually reached Southwestern Europe around 8,000 BP had their demographic roots directly within the Near East, but possibly not in Central Anatolia, in line with the cultural diffusion hypothesis. We discuss our results in the context of material cultural exchange patterns of the Neolithic period. Abstract - This article presents results of new research on the Mesolithic burial site at Groß Fredenwalde in northeastern Germany, where a multiple burial was first discovered by accident in 1962. Anthropological analyses identified one female with a child and two males with two children within this material. According to systematic AMS dating and 15N/13C-isotope analyses the individuals are typical Mesolithic hunter-fisher-gatherers of the Atlantic period (c. 6 000 calBC). During re-excavation of the site in 2012-2014 three new burials including a disturbed child burial and a baby burial were recognised. There is also an outstanding burial: a young man was interred standing upright and then furnished in stages. The burial is without any parallel in Central Europe, although there are possible parallels at Olenij Ostrov in Karelia. Altogether nine individuals from at least four graves are now known; they probably belong to an early cemetery located at a prominent position in the landscape. AMS-dates assign the burials to the period from c. 6 400 to 4 900 calBC, and thus the site was in use when the first Linear Band Pottery farmers established the agricultural way of life in the region c. 5 200 calBC. Two successfully analysed individuals belong to the haplogroup U [precisely U5b with mutations at 12308G and 16270T] of mitochondrial lineages fitting well into the model of highly differentiated forager and farmer populations. Background: The archeological record indicates that the permanent settlement of Cyprus began with pioneering agriculturalists circa 11,000 years before present, (ca. 11,000 y BP). Subsequent colonization events followed, some recognized regionally. Here, we assess the Y-chromosome structure of Cyprus in context to regional populations and correlate it to phases of prehistoric colonization. Results: Analysis of haplotypes from 574 samples showed that island-wide substructure was barely significant in a spatial analysis of molecular variance (SAMOVA). 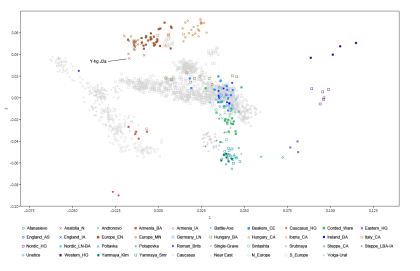 However, analyses of molecular variance (AMOVA) of haplogroups using 92 binary markers genotyped in 629 Cypriots revealed that the proportion of variance among the districts was irregularly distributed. 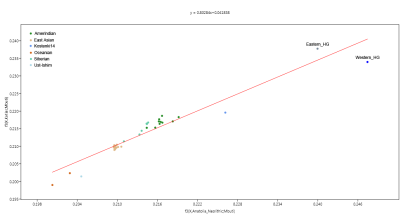 Principal component analysis (PCA) revealed potential genetic associations of Greek-Cypriots with neighbor populations. Contrasting haplogroups in the PCA were used as surrogates of parental populations. Admixture analyses suggested that the majority of G2a-P15 and R1b-M269 components were contributed by Anatolia and Levant sources, respectively, while Greece Balkans supplied the majority of E-V13 and J2a-M67. Haplotype-based expansion times were at historical levels suggestive of recent demography. Conclusions: Analyses of Cypriot haplogroup data are consistent with two stages of prehistoric settlement. E-V13 and E-M34 are widespread, and PCA suggests sourcing them to the Balkans and Levant/Anatolia, respectively. The persistent pre-Greek component is represented by elements of G2-U5(xL30) haplogroups: U5*, PF3147, and L293. J2b-M205 may contribute also to the pre-Greek strata. The majority of R1b-Z2105 lineages occur in both the westernmost and easternmost districts. Distinctively, sub-haplogroup R1b- M589 occurs only in the east. The absence of R1b- M589 lineages in Crete and the Balkans and the presence in Asia Minor are compatible with Late Bronze Age influences from Anatolia rather than from Mycenaean Greeks. Anatolian Neolithic farmer I0708 from the Mathieson et al. 2015 dataset belongs to Y-haplogroup J2a and is the most Caucasus-shifted of the early Anatolian farmers in my Principal Component Analysis (PCA) of West Eurasia (see below). This is unlikely to be a coincidence and provides strong evidence that at least some Neolithic farmers in western Anatolia harbored Caucasus Hunter-Gatherer (CHG) ancestry. Note that the two CHG genomes sequenced to date courtesy of Jones et al. 2015, Kotias and Satsurblia, belonged to Y-haplogroups J and J2a. Moreover, J2 today shows peaks in frequency and diversity in and around the Caucasus. In other words, Y-haplogroup J, and in particular J2, appear to represent paternal signals of CHG admixture. Unfortunately, it's not yet possible to demonstrate with formal tests beyond any doubt that I0708 has CHG admixture. For instance, the D-stats below, in which a couple of the least Caucasus-shifted Anatolian farmers are Anatolia Neolithic1, while I0708 is Anatolia Neolithic2, fail to reach significance (Z=3). Please note, I ran the stats with the Amerindian and Siberian samples to test for Ancient North Eurasian (ANE) admixture, which appears to be a feature of CHG. However, the results are all clearly positive, and might reach significance with higher quality data and/or a better reference than Anatolia Neolithic1. Indeed, the subtle difference in ANE affinity between Anatolia Neolithic1 and Anatolia Neolithic2 is underlined by the D-stats below. Note that here Kotias shows significant signals of admixture when paired with Anatolia Neolithic1, but not when paired with Anatolia Neolithic2. This is despite the fact that Anatolia Neolithic2 is a higher coverage sequence (6.95x vs 2.66x) and offers more markers. I0708 is unlikely to be the only early western Anatolian farmer with CHG/ANE admixture. The PCA above show that a couple of others are also pulling strongly towards the Caucasus. Indeed, all of the Anatolian and European Neolithic samples might harbor low levels of CHG ancestry. The problem with testing this idea at present is a lack of more basal Near Eastern ancient genomes from core areas of the Near East, like, say, the Levant. Hopefully they're on their way, but in any case, it's almost certain now that CHG was already expanding west, and in all likelihood east, during the early Neolithic. This probably has some important implications for the peopling of West Eurasia and their linguistic affinities. Feel free to post what these might be in the comments. Update 11/02/2016: I came up with new Anatolia Neolithic1 and Anatolia Neolithic2 sets using D-stats (by comparing each of the Anatolians to Kotias versus sample I0708). For a breakdown see here. Anatolia Neolithic2 now shows significant signals of admixture from Kotias, Dai, Surui and Han. This implies that it not only harbors CHG ancestry, but also ANE and East Asian-related admixtures. The idea of significant Ancient North Eurasian (ANE) admixture in Caucasus Hunter-Gatherers (CHG) was rejected in the paper that introduced us to the CHG metapopulation (see page 3 here). But to me it seems like an obvious conclusion when looking at the positions of the CHG genomes on a typical West Eurasian Principal Component Analysis (PCA) plot. For instance, see here. Note their massive eastern shift relative to all of the other present-day and ancient Near Eastern samples, in particular the Anatolian Neolithic farmers from Mathieson et al. 2015. We'll probably find out what's causing this shift in the next major paper on Eurasian paleogenomics. But I'd say that the analyses below, based on D-stats and f3-stats, comparing CHG genome Kotias to the Anatolian farmers, provide persuasive evidence that CHG is indeed admixed with ANE or something very closely related. Perhaps surprisingly, the Itelmen people of eastern Siberia produce the most significant Z-score in D-stats of the form D(Chimp,X)(Anatolia_Neolithic,Kotias), where X is every population from North and East Eurasia and the Americas in my dataset likely to harbor ANE. Mal'ta boy or MA1, the main ANE proxy, is way down the list with a non-significant (<3) result. However, I'm pretty sure that a higher coverage sequence with over 500K SNPs would come through with the goods. Note that here Kotias shares more alleles than predicted by the line of best fit with most Amerindians, most Siberians and Eastern Hunter-Gatherers (EHG), but not East Asians or Western Hunter-Gatherers (WHG). I can't think of anything other than ANE that might be causing this, because whatever it is, it has to be shared by these Amerindians, Siberians and EHG, to the exclusion of East Asians and WHG. 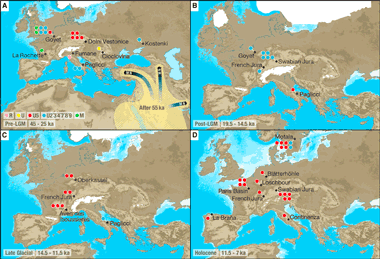 Current Biology has an important new paper on the peopling of Europe (see here). The big question left open by the authors is where exactly did Western European Hunter-Gatherers (WHG) rich in Y-HG I2 and mtDNA U5 come from if, as the authors suggest, they weren't native to Western Europe. According to them it was "another, separate LGM refugium". Balkans? Summary: How modern humans dispersed into Eurasia and Australasia, including the number of separate expansions and their timings, is highly debated [ 1, 2 ]. 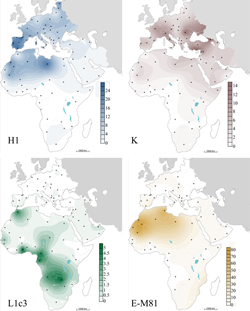 Two categories of models are proposed for the dispersal of non-Africans: (1) single dispersal, i.e., a single major diffusion of modern humans across Eurasia and Australasia [ 3–5 ]; and (2) multiple dispersal, i.e., additional earlier population expansions that may have contributed to the genetic diversity of some present-day humans outside of Africa [ 6–9 ]. Many variants of these models focus largely on Asia and Australasia, neglecting human dispersal into Europe, thus explaining only a subset of the entire colonization process outside of Africa [ 3–5, 8, 9 ]. The genetic diversity of the first modern humans who spread into Europe during the Late Pleistocene and the impact of subsequent climatic events on their demography are largely unknown. Here we analyze 55 complete human mitochondrial genomes (mtDNAs) of hunter-gatherers spanning ∼35,000 years of European prehistory. We unexpectedly find mtDNA lineage M in individuals prior to the Last Glacial Maximum (LGM). This lineage is absent in contemporary Europeans, although it is found at high frequency in modern Asians, Australasians, and Native Americans. Dating the most recent common ancestor of each of the modern non-African mtDNA clades reveals their single, late, and rapid dispersal less than 55,000 years ago. Demographic modeling not only indicates an LGM genetic bottleneck, but also provides surprising evidence of a major population turnover in Europe around 14,500 years ago during the Late Glacial, a period of climatic instability at the end of the Pleistocene.